We are very sorry to announce that the Hotknives (original line up) are no longer able to play at The London International Ska Festival 2012. We are all deeply disappointed as they were one of the highlights of last years festival. We’d like to wish all the members the very best and hope to be working again with them very soon! We are currently lining up some truly world class acts as replacements. First of which will be announced shortly. 4 scorching new exclusive singles – on 2 ltd.edition 7″ vinyl records. One of 2 Tone Records greatest musicians, songwriters and founder of The Selecter, Neol Davies returns with a superb new single ‘Dolla Fe Dolla’ exclusively for The London Intl Ska Festival 2012. 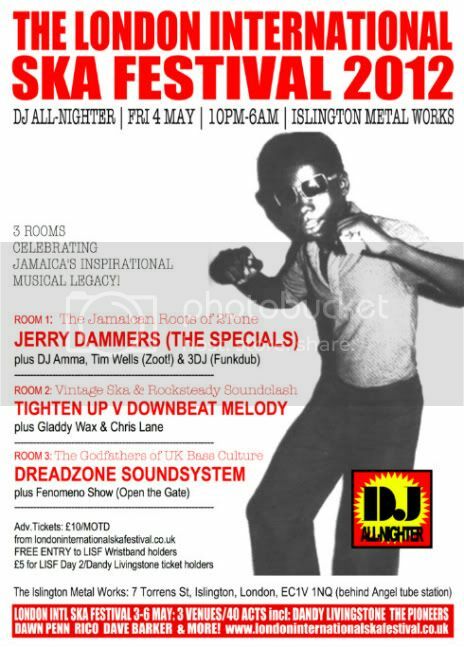 The man who wrote ‘3 Minute Hero’, ‘Missing Words’, ‘Celebrate The Bullet’, ‘On My Radio’ & the track that started it all, the AAside to The Specials-Gangsters, The Selecter, plays Day 4 of The London Intl Festival (6 May – O2 Academy Islington) along with Fishbone, The Skints, Don Letts and many more. The flipside features one of the UK’s most loved Ska acts – The Dualers and is taken from their upcoming Prince Buster Shakedown album, a tribute to the undisputed King of Ska. The Dualers headline day 3 of the festival at O2 Shepherds Bush Empire on 5 May, along with Ska Cubano, Freddie Notes (Jamaica reggae pioneer famed for his Montego Bay smash hit), Buster Shuffle and more. Phoenix City All-stars are the brainchild of Pama Intl’s Sean Flowerdew. They will be backing Dandy Livingstone on his world exclusive comeback show at day 2 of The London Intl Ska Festival (4 May at O2 Academy Islington) as well as Rico Rodriguez and the voice of Dave & Ansell Collins – Mr. Dave Barker. Drawing inspiration from Studio One & The Skatalites Phoenix City All-stars entered the studio to record this exclusive blazin Ska version of Carol King’s Will You Still Love Me Tomorrow featuring reggae legend Dave Barker on vocals, especially for the ska fest. They have also recorded their debut album (out this summer) – ‘2 Tone Gone Ska’.. an unbeatable & unique repatriation of 2 Tones greatest hits to “the Sounds of Young Jamica”. The flipside on LISF7-2 is taken from this very album. Catch The Phoenix City all-stars this summer at select shows (Vintage festival, One Love festival, Notting Hill Carnival, Isle of Wight scooter rally & Ronny Scotts). All 4 songs will be on general release digitally on Phoenix City/Cherry Red Records from 7th May 2012. Please note This offer only runs from 30th March – 6th April and is limited to the first 100 people. Be sure to seek out the March issue of Echoes magazine (out now). It features a wonderful double page interview with Dandy Livingstone. The first in many years. Dandy (famed for his hits Rudy A Message To You, Suzanne Beware of the Devil, Reggae In The Jeggae, Version Girl, Bright Lights, People Get Ready and as the producer that launched Trojan Records, performs his world exclusive show at Day 2 of The London Intl Ska Festival 2012 (4 May @ O2 Islington Academy), along with Dave Barker, Rico Rodriguez, Phoenix City All-stars, Los Granadians & DJ Gladdy Wax. Any problems getting hold of a copy of Echoes telephone their subscription line on 01763 244366.